Books are the tools we love best. They have a way of connecting people across the globe, and over the centuries. Books help us discover and celebrate the beauty of our improbable blue world. And books provide us with the tools we all need to live lighter on the land. Our webpages (listed above) describes the Land Library’s books, programs, and the emerging Headwaters to Plains Network — a series of book-lined spaces, encouraging discovery, quiet thought, creative pursuits, and active community involvement. Over the years, our website has also featured posts on some of the books that excite us to no end. You’ll also see that we report on the once-in-a-lifetime opportunity we all have to restore a historic Colorado ranch. Set in the high mountain grasslands of South Park, Buffalo Peaks Ranch will soon be the headwater site of a residential library — a place where you can come and stay for as long as you like. Read about concrete corral stalls given new life as artist studios, our plans for a Land Library for inner-city Denver, complete with its very own Seed Library. But as you’ll see from many years of web posts, we are happiest when reporting on books inspired by a sense of wonder, and hopeful for an even brighter future ahead. “The Rocky Mountain Land Library is like a gene bank for words, it’s our way of saving the past for the future.“ — David Mas Masumoto, farmer and author. For more information on the Rocky Mountain Land Library, please contact jeff@landlibrary.org. We are thrilled to announce that Nick Arvin (author of Articles of War, Mad Boy, and other works of fiction) will be leading the discussion of our first pick for the Globeville Book Club: The Summer Book, Tove Jansson’s highly acclaimed novel that tells the unsentimental tale of a six-year old girl and her grandmother’s summer days on an island in the Gulf of Finland. Join us on Sunday, April 28th, 1-3pm at the Rocky Mountain Land Library’s new Globeville Library for what we are sure will be a very fun & interesting discussion! Tove Jansson (1914-2001) was a Swedish-speaking Finnish author, novelist, painter, illustrator, and perhaps most famously, she was the author of the award-winning Moomin books for children, including Finn Family Moomintroll. Tove Jansson also wrote six novels for adults, and five books of short stories. The Summer Book, published in 1972, continues to gain enthusiastic new readers every year. We are thrilled to announce our first slate of events, programs & classes at the Rocky Mountain Land Library’s new urban outpost in Denver’s Globeville neighborhood! Come join us for a special Open House on Sunday, March 31st, 1-3pm! 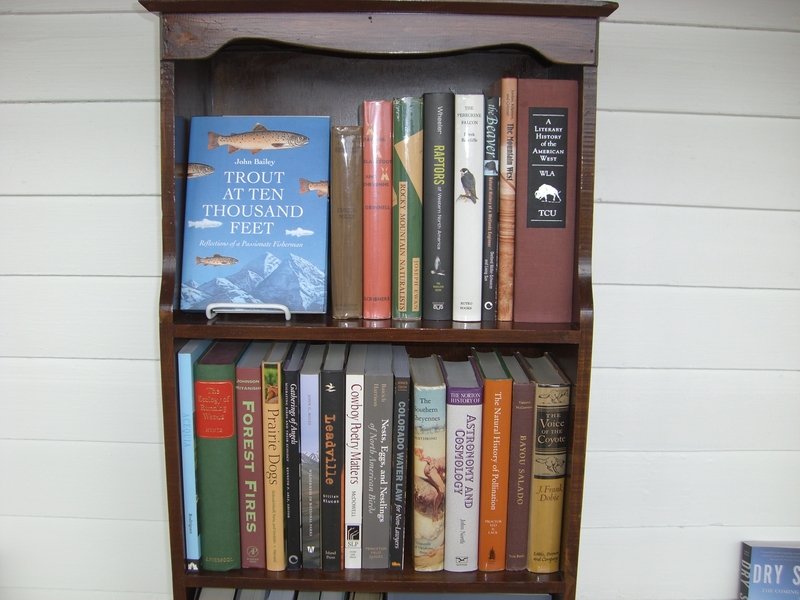 You’ll be able to see and experience our new Globeville Library, which is filling up with books on the natural & cultural history of the American West, along with hundreds of titles with a special focus on nature-in-the-city. And you’ll see the work that is already underway, as volunteers continue to unpack over 1,000 boxes of books – some destined for Buffalo Peaks Ranch, and others for the city. We’ll have food and drink, plus some handy information on the Rocky Mountain Land Library, and all the ways you can make the it your own. On Saturday, April 13th we will be hosting an Open Workshop featuring a variety of Bookbinding techniques, including crafting a book from flat river rocks (found along the South Platte River as it flows through Buffalo Peaks Ranch). . This will be an Open Workshop, suitable for anyone. We’ll all be exploring and experimenting together! We’ll also have plenty of time to dive into the Land Library’s books on book arts, including the very creative volume that inspired this workshop: Erica Ekrem’s Bound by Hand. We have a limited number of Buffalo Peaks Ranch river rocks, and those come in variable sizes. If you sign-up for this workshop, be sure to select the ticket for the rock size you wish to work with (small, medium, or large). All tickets are priced the same! Our First Globeville Book Club Pick to be led by author Nick Arvin! On Saturday, May 4th we will be hosting a workshop on making ink from foraged plants and discarded city debris (rusty wire, copper pennies, and the like). We’ll start the day foraging along the South Platte River, then return to our new Globeville Library, where we’ll begin to make inks from our urban harvest. This will be an Open Workshop, suitable for anyone. The day will be all about exploring & experimenting together! We’ll also have plenty of time to dive into the Land Library’s books on foraging and dyes, including the remarkable book that inspired this workshop: Jason Logan’s Make Ink: A Forager’s Guide to Natural Inkmaking. (This link will take you to a wonderful film clip, featuring Jason Logan in the urban wilds). Stay tuned for more Globeville event announcements, plus the 2019 Buffalo Peaks Ranch Summer Schedule. There’s a lot happening at both ends of the South Platte River! We love Kim Shively’s short film that captures one of the most remarkable weekends Buffalo Peaks Ranch has ever experienced. This past Labor Day, the RedLine Contemporary Art Center presented the Re/Call exhibition, which brought 19 artists from across the country to the ranch. If you missed that remarkable weekend, please take a look at this wonderful video! Ann Martin & Jeff Lee, co-founders of the Rocky Mountain Land Library. As 2018 draws to a close, we wanted to catch-up with the Rocky Mountain Land Library’s co-founders, Jeff Lee and Ann Martin. Jeff and Ann have been booksellers at Denver’s Tattered Cover for over 30 years. Back in the 90’s, while on a book-buying trip for the store, they came upon St Deiniol’s Residential Library in Wales. That visit was the start of their dream to create a residential library in Colorado – one focused on people and the land. The dream has grown since that trip. Just this past month, Jeff and Ann officially donated the books they have been gathering for the Land Library, a collection valued at more than $600,000. The Land Library social media team (LL) spoke with Jeff before the holidays. We hope to corral Ann later! LL: How did two booksellers acquire more than 40,000 books, plus a 95-year lease at a historic Colorado ranch? Jeff: Wow, that’s a long story, and one that’s about many more people than Ann and I! But, as for the 40,000 books, a big part of that can be explained by the fact that Ann and I have worked at the Tattered Cover Book Store for more than 30 years. With that daily immersion in the world of books, the Land Library has grown, book by book, year after year. Once Ann and I committed to the idea of a residential library, we also decided to take the first step by actually buying the books themselves. We felt that it was important to make the Land Library real, from the very start. LL: But you only donated the books a few weeks ago? Jeff: Right — the books were always meant for the Land Library, we just felt it was time to make it official. LL: OK, so you gathered a book collection valued at more than $600,000, but how did the Land Library acquire Buffalo Peaks Ranch? Jeff: Well, other than the books, we’ve never had much money behind us. We definitely could never even think of purchasing a 1,500 acre ranch, especially one that has been listed on the National Register of Historic Places. But by working with Park County and the City of Aurora (the ranch’s owner), we were able to sign a 95-year lease at Buffalo Peaks Ranch. We are definitely in it for the long haul! We’re already planning our most ambitious summer of ranch renovation & programs, coming up in 2019. We hope everyone will stay tuned for that! The Horse Barn at Buffalo Peaks Ranch. The Land Library’s new home in Globeville. What will we find when we start opening those boxes? Jeff: I think everyone will find great books — both eye-opening and inspiring — and there will be lots of surprises too! Ron Dirlam, our favorite carpenter, in front of his handiwork, as the first few books hit the shelves at Globeville. The core of the Land Library’s collection has always been about people and the land. That takes in natural history, a range of environmental issues, Western & Native American history, literature, poetry, art, and more. The Land Library’s books are also rooted in the diverse cultures that define where we all live. We’ve also sought out titles that help us live lighter on the land. In short, we hope the Land Library’s books will be used as tools for all of us, as we move forward. 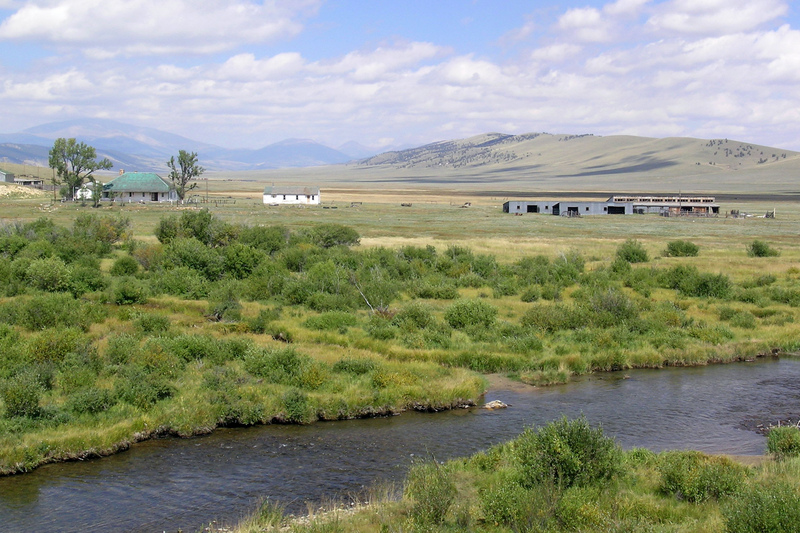 The Middle Fork of the South Platte River flows through the ranch. photo by Samuel Bell. One other thing I should mention: There’s a certain tone that we’ve always tried to strike with the books we’ve gathered. Plenty of our titles challenge us to do better, and to fix the harm our way of living inflicts on the earth. We need those books! That’s the feeling we hope the Land Library will foster, from Buffalo Peaks Ranch, to Denver’s Globeville neighborhood. Early morning mist at Buffalo Peaks Ranch. photo by Larry Glass. LL: Last question: what are you reading now? Jeff: For some reason I’ve been reading a lot of British nature writers lately. I finished up Helen Jukes’ beekeeping memoir, A Honeybee Heart Has Five Openings (I loved it! ), and now I’m reading Horatio Clare’s winter journal, The Light in the Dark. I’m really liking that book – it’s helping me to get a fresh outlook on our season of snow & cold! Our Year-end Fundraising Campaign wraps up in a week! Rocky Mountain Land Library, 2550 W. 39th Avenue, Denver, CO 80211. Our year-end Fundraising Campaign got off to a great start, this past #GivingTuesday! But there’s more to come over the next few weeks. The funds we raise will fuel our ongoing efforts to establish a Headwaters to Plains Network — a network of library/learning centers focused on people and the land. Each library, spanning the urban/rural divide, will encourage discovery, quiet thought, creative pursuits, and active community involvement. Over the next four weeks we will send out weekly updates on our plans for 2019. The Land Library has ambitious goals ahead but we’ll need your support. We are excited about what we all can accomplish in the year ahead! Our friend (& master carpenter) Ron Dirlam at our emerging urban Land Library in Denver’s Globeville neighborhood. Step by step, book by book! Our amazing Eagle Scout-candidate Sam Bell just sent a terrific batch of Buffalo Peaks Ranch photos. Sam really captured the changing season in South Park! Here’s the Cooks House, with Mount Silverheels (13,829 ft) in the distance. Next spring, the Cooks House renovation will be complete, with two new lodgings, a great kitchen & meeting place, plus a library dedicated to food, farming, and culinary traditions from across the globe. Sam was there at Main House’s front porch, just as the sun rose over Reinecker Ridge. A wonderful view of the Lambing Barn & sheds — the future site of a River Hut Library, featuring books on water, rivers & angling. The South Platte River is running low, but trout still abound, and the beavers seem happy too! The river is such a special part of Buffalo Peaks Ranch. It always feels good to make time to walk (& talk) along the meanders. The grasses of Buffalo Peaks Ranch have really captivated us this past summer. We would love to have a special field class next summer on the grasses, sedges, and rushes of this historic South Park ranch. Stay tuned! Thanks to Sam Bell for sharing these wonderful photos!